Even after a week I still cannot get his songs out of my head. If I was not a big enough fan last week going into the concert hall, I am definitely one now. 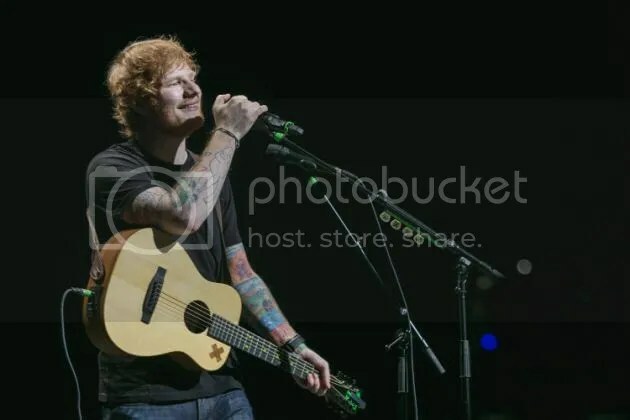 Ed Sheeran’s 14th of March 2015, Singapore concert was sold out within a few hours when it went on sale late 2014. I barely managed to grab tickets. It came to a point where I did not care where I was sitting, as long as I’m THERE. The Star Theatre at Buona Vista was buzzing with excitement the moment I stepped inside. Everywhere I saw fans who made signs for Ed, designed t-shirts with his lyrics and song titles, and even a lit up cut-out of Ed’s head! Turned out my seats were pretty decent even though it was two levels up from the stage, we can see the whole stage clearly. Ed walked out onto the stage confidently to deafening screams that left my ears ringing even after his first song, I’m a Mess. He was just there all alone on stage with his guitar and yet I felt like he was one of the most engaging singer I’ve ever seen live. 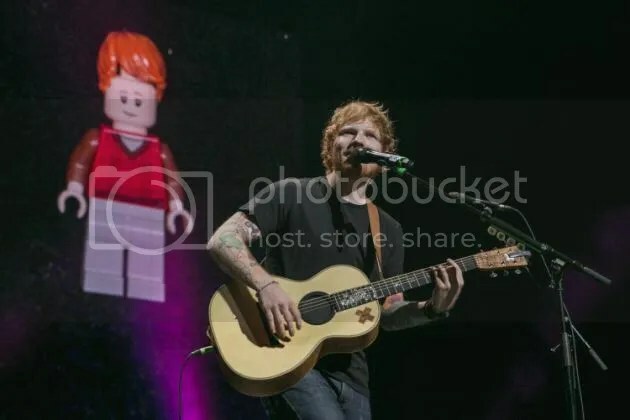 Unlike other artist who tend to leave their more popular songs towards the end of a concert, Ed interspersed his performance with his singles throughout. That was one of the many things i truly appreciate that Ed does. He sang one of his first songs that put him on the map, Lego House, as the second song. Again, the crowd went absolutely crazy the moment he strummed the first few notes of the song. You can almost feel the whole room falling in love when he broke out into Thinking Out Loud. I could not help but swayed along so hard that I accidentally nudged the stranger beside me. Ooops! Known for his ballads and love songs, Ed showed us a different side to him. Little did I know that the ginger haired guy was into rap music. In fact, he was REALLY good at it. The whole place roared when he started a remix of In Da Club (by 50 Cents) and Fancy (by Iggy Azalea and Charlie XCX). He really knows how to work the crowd with his impressive guitar skills. There was one point of time that the hall got really quiet when he was singing Photograph. You can sense that the room was just absorbing and appreciating his melodic voice. And then one by one, people started to flash their lights and started waving it in the air. 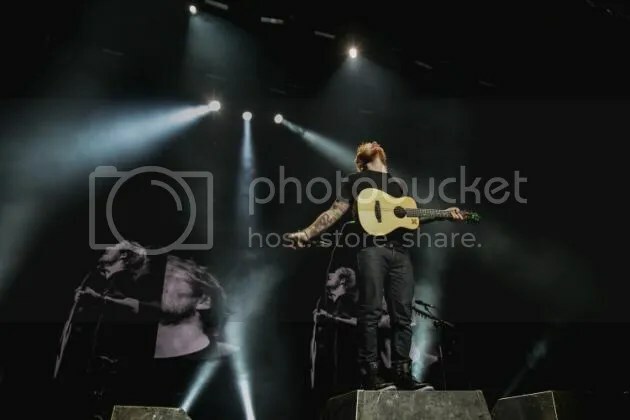 In an instant the whole theater was lit with thousands of tiny little white lights, accompanying Ed’s beautiful performance. It was magical. Towards the end, during Give Me Love, Ed told us it was technically his last song. But of course we know there was encore. But at that point of time it felt like it was too short! I wanted more! Of course he did not leave without performing Sing, one of his most upbeat songs. 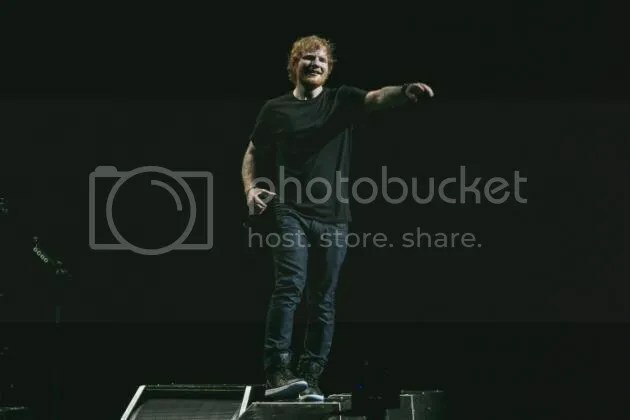 He got the whole place dancing and singing our hearts out and he told us to “Keep singing Singapore!”, when suddenly I saw him slowly walking backwards, and just like that, the lights went up, show was over and Ed Sheeran was gone. The way the concert ended was cruel and genius at the same time. It took me a good half an hour to get over it. My only regret besides the ending? He did not perform All Of The Stars from the movie, The Fault In Our Stars. Ed Sheeran is a performer in every sense of word. His singing live is impeccable, his guitar skills are out of this world, and his rapping skill is surprisingly on point. I cannot express just how good was his live show. If you’re ever given a chance to catch him live, please do! If Ed Sheeran ever decide to come to Singapore again for concert, I AM THERE.